5,000-LB. 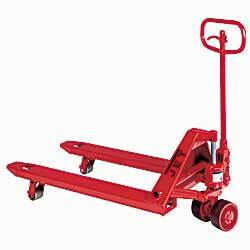 CAPACITY LOW-PROFILE PALLET TRUCK. 6"W x 48"L forks raise load from 2-1/2" to 6-1/4". Cross-welded steel plates reinforce the heavy-gauge frame. Tapered and inclined fork tips ease pallet entry/exit. 6-1/4" steer wheel, 2-1/2" load wheels. 6" wide forks. IN STOCK. Move heavy loads up to 6,000 lbs. Handle includes a three-position (raise, lower, neutral) lever for fingertip control and one-hand operation. Narrow 200° turning radius eases maneuverability around pallets and dock boards. Other features include: solid steel lifting rods, polyurethane covered steer and load wheels with double sealed bearings, grease fittings and oilless bearings, and overload bypass protection valve. Two-year warranty on pump. Made in China. HEAVY-DUTY PREMIUM 6,000-LB. CAPACITY TRUCK. Fork height: 2-7/8" to 7-3/4". Includes: ergonomic cushioned handle, articulating axle, special lowering valve to control rate of descent, and rounded fork tips with nylon rollers. 7" steer wheels, 2-7/8" load wheels, 6-1/4" wide forks. SPECIFY FORK SIZE: A - 21"W x 36"L, C - 21"W x 48"L, E - 27"W x 42"L, F - 27"W x 48"L. F - 27"W x 48"L IS IN STOCK. Others FOB WASHINGTON. XC-3178A 21" x 36"	 21" x 36"	 Wt. 200 lbs. XC-3178C 21" x 48"	 21" x 48"	 Wt. 200 lbs. XC-3178E 27" x 42"	 27" x 42"	 Wt. 200 lbs. XC-3178F 27" x 48"	 27" x 48"	 Wt. 200 lbs.